Honor the memory of a loyal and much-loved friend. 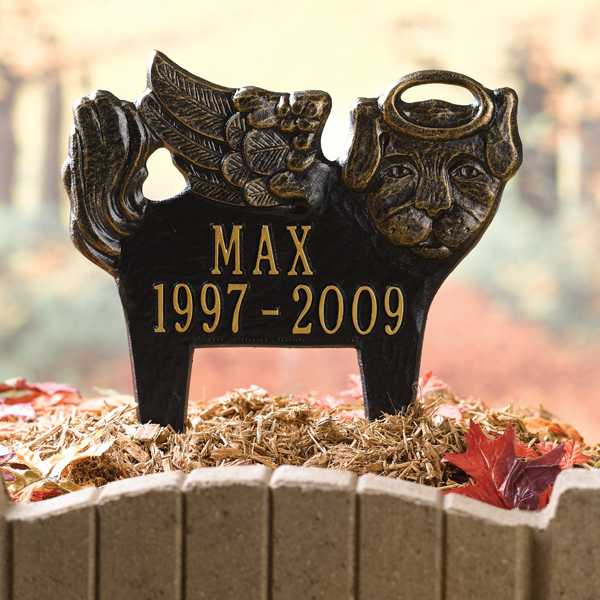 A dog angel (with wings and halo) is handcrafted from rustfree cast aluminum with a weather-resistant finish that will last a lifetime. Specify up to 2 lines of up to 8 characters each-name, year of birth, year of passing. Bronze with gold letters, 11 3/4" x 12 1/2" marker stakes into the ground. Allow 3 weeks. No rush delivery or gift box.